Born in Albany, New York on December 21, 1902. Commissioned in the Corps of Engineers from West Point in 1926. Instructor at West Point 1935-1939. Graduated from Command and General Staff School in 1940. With 2nd Engineers at Fort Sam Houston in 1940. Assistant to the District Engineer in Seattle 1940-1942. Director of Ports, then Chief of Staff, finally Commanding General of the Persian Gulf Command October 1942-August 1945. Brigadier General in May 1944. Assignments after the war included Commanding General of 28th Infantry Division 1953-1954, Commanding General of 9th Infantry Division in 1954. 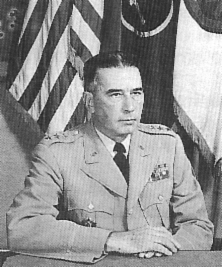 Deputy Assistant Chief of Staff, then Assistant Chief of Staff, finally Deputy Chief of Staff for Personnel, U.S. Army 1954-1957, High Commissioner of the Ryukyu Islands 1958-1961 and Commanding General of Fourth Army 1961-1962. Retired as Lieutenant General on February 28, 1962. Died on October 30, 1993.